The Staffordshire Bull Terrier is a purebreed dog with a relatively short albeit dynamic history. Although they were originally pit-fighting dogs that were bred specifically from Bull-and-Terriers to be smaller, faster and more vicious, they were also bred to be easily handled, more intelligent and not dangerous to humans. 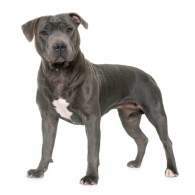 Due to their dog-fighting history from the 19th century, Staffies (as they are affectionately known) were ostracized early on by established kennel clubs but were loved by their breeders — who kept copious notes and created a concise history prior to the breed finally being formally accepted by clubs in the 20th century. While they make great family pets and absolutely adore children (they are sometimes called the "nanny dog"), Staffordshire Bull Terriers are not for everyone: if you are not already experienced with dogs and don't quite understand how to establish yourself as the alpha, the Staffie may not be for you. Although they are suitable for indoor living, they are better suited for a single pet household. Despite its looks and (often false) reputation, this guy should not be considered a guard dog. When mature, the Staffordshire Bull Terrier female stands 13-15 inches; the males are a bit taller at 14-16 inches. Males weigh 25-38 pounds, and females are 24-35 pounds. 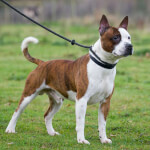 This breed is the smallest of all Bull Terriers and, in general, is considered on the small end of "medium sized" dogs. Don't believe the hype when it comes to the Staffie: she is a very personable dog who can't meet enough people and who loves kids. (Even when they were bred as fighting dogs in the 1800s, they were appreciated for their ability to be amenable to human touch even as they prepared to enter the dog-fighting pit.) With other pets, however, they tend to not be so friendly — especially with cats and other dogs. In any case, Staffies are not for first-time dog owners. 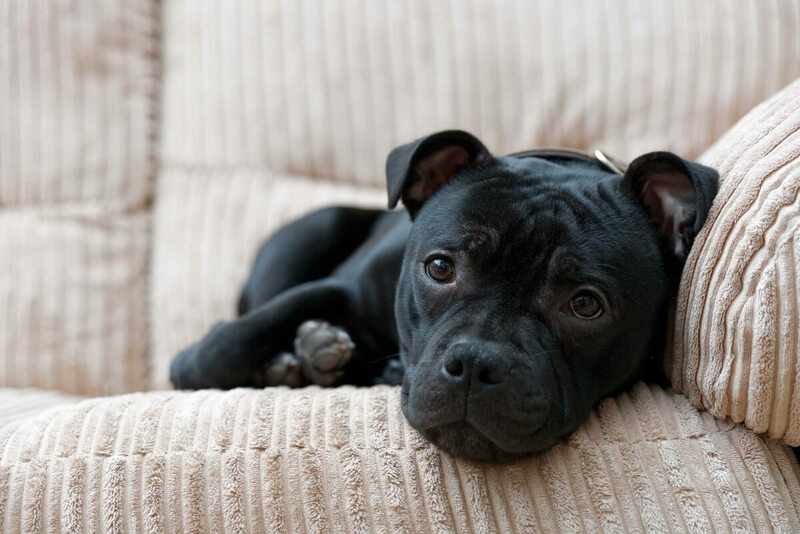 Your Staffordshire Bull Terrier will be a high-maintenance dog that will need a lot of daily exercise, companionship and attention; as for grooming, they will need much less than most dogs. An hour or so playing outdoors or in a fenced area will do wonders to fend off boredom! They need to spend at least part of the day with their family, even if this just means lazing on the couch while you watch TV. Besides the typical ear, teeth, and nail maintenance, a weekly brushing to remove dead hairs is all that is necessary. 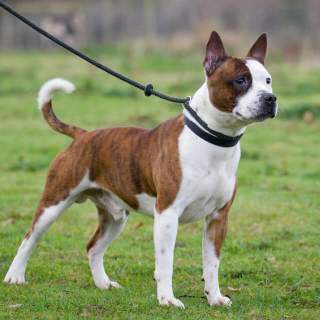 In the mid-19th century, the Staffordshire Bull Terrier was one of two breeds produced by James Hinks by crossing a Bulldog with various British Terriers (such as the Manchester and English White Terriers, the latter of which is now extinct) to produce Bull-and-Terriers. The Staffie was not granted the same respect as some of these other Bull-and-Terrier breeds until a few decades later in 1935. 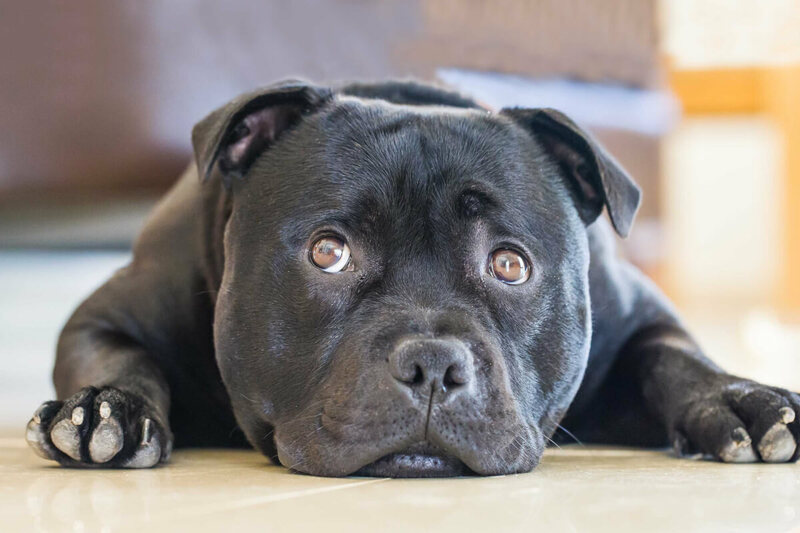 The breed's history, however, goes back a bit further than the name; Staffordshire Bull Terriers came from dogs bred to be smaller, faster and thoroughly fearless in the fighting pits whereby dogs faced off with bears, bulls and eventually, other dogs. Although England outlawed the blood sports of dog-fighting as well as bull- and bear-baiting in 1935, dog-fighting remained popular among the working class that emerged with the Industrial Revolution. Unlike the arenas required for the bull and bear fights, dog fights could be executed in very small spaces and were difficult to find while in progress. This breed acquired notoriety due to being found primarily among miners and other common people. The nimble dog's strong jaws, remarkable stamina and astounding tolerance for pain made it a favorite among the dog-fighting spectators, and their lack of aggression toward people was especially favored by the handlers for obvious reasons. Ironically, the Staffie was recognized by the Kennel Club (in England) exactly 100 years after the Humane Act of 1835 was passed to officially ban blood sports. The 1930s was a banner decade for the Staffordshire Bull Terrier. Not only was the breed finally officially recognized one month before the breed's first club was conceived (which was a very unusual event in itself; clubs usually precede recognition in order to acquire it), but there was a number of articles in Our Dogs, a Staffordshire journal, as well as the breed's first club show (August, 1935 at Cradley Heath). In 1936, the breed made a huge seminal splash at the Crufts, and the many awards won by the various Stafford Bull Terriers ensured the dog's place on the world map. Later that same year, at the Wembley National Dog Show, Staffords were given two classes and even the London Star noted the breed's acceptance. Nevertheless, the Staffordshire Bull Terrier remains resemblant of the pugnacious dog that not 200 years ago ruled the dog-fighting pits. This mere physical resemblance, however, created in the UK a problem about three decades ago, one that continues to this day as well as has affected public opinion in the U.S. 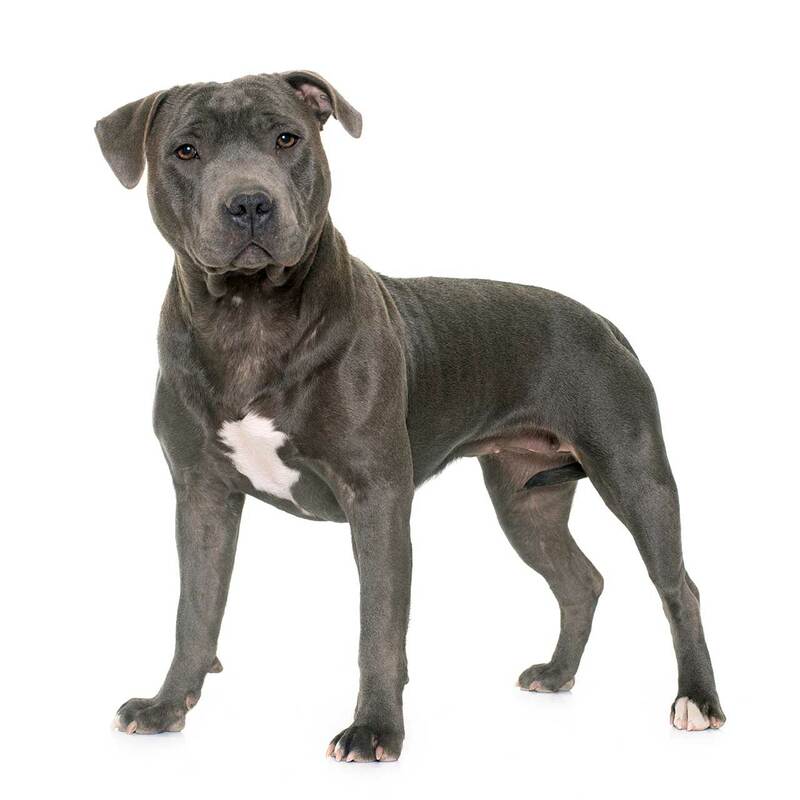 In the 1980s, some people started to breed dogs scarily similar to American Pit Bulls (which in every way are considerably larger than Staffies) and exported them to England as "Irish Staffordshire Bull Terriers" for dog-fighting. Because of the similar names and somewhat similar physiques, the UK press prompted a perception that Staffordshire Bull Terriers were responsible for a number of gruesome attacks that left children mauled, unsuspecting owners dead and an on-going wave of hysteria that has caused the public to confuse the Staffie with other Bull Terriers. 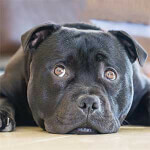 Many kennel clubs and Staffie owners have taken to trying to educate the public on the vast differences, but the incorrect media profile has proved difficult to rectify. In March, 2016, however, the UK Ministry of Justice's Sentencing Council took a first step toward resolution by holding accountable problem owners who are responsible for the confusion (that was deliberately conceived as a smokescreen to hide the illegal importation of these other Bull Terriers), and the UK-based Kennel Club has commented that it is a move in the right direction. The Staffordshire Bull Terrier is distinctly different — and smaller too — than all other Bull Terriers. They are medium-sized muscular dogs with a short, broad heads, somewhat short snouts and small ears that are shaped differently than similarly named breeds; the ears are erect near the base and fold forward. Their coats are short and smooth and exist in several different colors and combinations of those colors including: black, blue, white, fawn, red, brindle (with or without white) and any combination of the aforementioned. Their front legs are straight and their low-set tails are thicker at the base as well as carried low with very little curling. The coat of the Staffordshire Bull Terrier comes in black, blue, white, fawn, red or any combination thereof. They may also be brindle with white. Members of this breed are considered on the small side of medium. Staffordshire Bull Terrier females are 13 to 15 inches high, and the males are slightly taller at 14 to 16 inches. Male Staffords will weigh from 25 to 38 pounds whereas the females weigh from 24 to 35 pounds. The Staffordshire Bull Terrier has little variation within its own breed, but these dogs are often confused (and interbred) with other Bull Terriers, most notably the American Pit Bull Terrier and the American Staffordshire Terrier. The Staffy is typically smaller than the Am-Staff and the Pit Bull, and usually has shorter legs. Confusion exists (and debate rages on) within the Staffordshire Bull Terrier breed because through the years, breeders have crossbred them in numerous combinations and given them unique names (the Australian Staffy, the King Staffy, the Mini Staffy, and the Long-Legged Staffy, just to name a few), then claimed to have created a unique crossbreed. While this may sometimes be the case, nearly every Bull Terrier dog has the DNA of one (or more) of these three purebreds. The big purebred Staffy also see little variety in their coat types: short-haired and smooth is the norm, in a variety of colors. In regards to size, purebred Staffies don't vary much from dog to dog, and average 14 inches in height and 30 pounds in weight. As mentioned above, years of selective crossbreeding has developed what most consider sub-types of this breed, though they are in all likelihood hybrid dogs. The Long-Legged Staffordshire Bull Terrier, for example, can reach upwards of 20 inches in height and 65 pounds in weight, but many argue that a Long-Legged Staffy is a crossbreed, probably a Staffy-Pit Bull mix. What many people believe is a Miniature Staffordshire Bull Terrier, meanwhile, is often another purebred dog entirely: the Miniature Bull Terrier, which is a separate, recognized breed. Despite the media hoopla that has arisen due to the other Bull Terriers being mistaken as Staffordshire Bull Terriers, your Staffie will be a people-friendly dog whose love of children and other family members may as well be second-to-none. They are extremely loyal and very eager to please — but must be taught early on that you are the alpha. They don't make good watchdogs despite their long-ago history of dog-fighting; they tend to protect people rather than property, and some breeders joke that they will welcome burglars so long as no one is home. They are highly intelligent, possess an intense stare and may appear intimidating, but their lively eyes will belie their amiable demeanor. They must be trained and socialized very early, and they need to be taught as pups to not chew; as they grow and mature, they should have lots of very durable chew toys that can't be easily broken down lest they swallow the fragments. 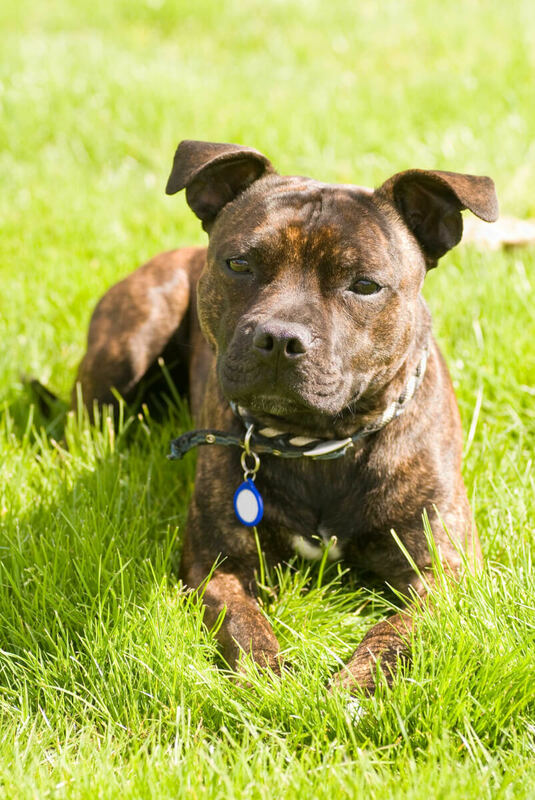 While they are easy to train in most ways, house-training is often difficult and is one more reason that Staffies should be adopted by people who clearly understand the responsibilities of ownership. Most important is to understand that despite their friendly personality they are fearless and may behave in a fashion that is a danger more to themselves than people. Their curiosity may lead them to leap from high places, dash through glass doors and tangle with things that can cause them harm. There are few dogs that love children more than Staffies. Although they may play a bit roughly — which can and should be curbed, especially if you have very young kids — they have a remarkable tolerance too. They are sometimes called the "nanny dog" due to their predisposition to delightfully play with and diligently guard children. The best results, for any breed, are obtained when the dog can be socialized with children beginning at puppy age and children should be taught early how to appropriately handle a pet. Your Staffordshire Bull Terrier must be trained and socialized early on to ensure they get along well with other pets, and when in public they should always be kept on the leash. While they are great with people, they still have a history of being bred to fight other dogs and that unfortunate trait can emerge suddenly. Still, they are best brought up in single-pet homes. The Staffordshire Bull Terrier is not only not a watchdog but a breed that tends to welcome anyone so long as a physical threat is not imminent and their family members are not concerned. Still, they should be trained and socialized early so as to not scare people or jump up in their desire to greet new friends. 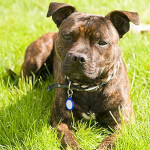 Below are pictures and images of the Staffordshire Bull Terrier. Staffordshire Bull Terriers are high-maintenance dogs that require a lot of daily exercise, near-constant training and quite a bit of attention. Ensuring your pet spends time with you daily whether it be accompanying you on your daily walk around the block or lying next to you on the couch will allow them to feel like part of the family. Daily walks, jogs, and outdoor playtime (as well as plenty of chew toys) will assist in keeping them from becoming obese, or much worse-- bored! They don't need nearly as much grooming as most dogs, however, and a weekly brushing should help to remove some of the dead hairs from their coat. This breed does shed lightly all year around and will do so heavily once per year. The Staffordshire Bull Terrier has a short coat and as such, sheds very little — but there is the coat blowout that should be anticipated annually. Nevertheless, they should be brushed at least once a week to clear out the dead hair. Bathe only when needed (i.e., when he gets noticeably dirty), and be sure to check his ears, eyes and teeth weekly as well. While cleaning his teeth a few times weekly is suggested, a weekly cleaning (gently!) of his ears is required. As with all dogs, if you hear his nails clicking when he walks, it's time to clip them. Along with the many other responsibilities of living with a Staffie, exercise is also a big part of her day — every day. She has a lot of energy to burn off, and very long daily walks, near-constant companionship and a fair amount of play time should be on your calendar every day. Keeping your pet leashed while on walks is advised, as this breed can sometimes be aggressive towards other dogs and small animals. Don't be surprised if her stamina seems to never fade after a long day of running, playing and jumping. She should also have loads of toys that can withstand a great amount of chewing and won't disintegrate to reveal small, hard parts that she may swallow. Left alone and with little to no exercise, she will quickly develop bad habits such as constant barking, chewing on everything and destroying property. 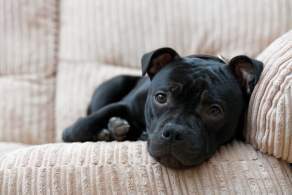 Staffordshire Bull Terriers do just fine in apartments or houses with large yards, but they should not be left alone for long periods of time whether outside or at home. If you live in an apartment, be sure to exercise him every day and at length; if you live in a house with a yard in which he is allowed to play, be sure he can't jump over or dig out as Staffies can leap high when excited and tend to dig when possible. The Staffordshire Bull Terrier doesn't adapt well to hot climates due to the short snout that doesn't allow air to cool as it passes to the lungs. He should have ample shade and perhaps even a small, shallow wading pool. (Staffies are not known to be good swimmers, it should be noted.) Easy entry to the house should be available in case he gets uncomfortable in the heat. People in some parts of the world--most notably, in Great Britain--refer to the Staffordshire Bull Terrier as a "nanny dog." This is a bit of a misnomer, as Staffies (along with other Bull Terriers that carry the label) have never actually been known to "care for" children without supervision; even so, the breed normally socializes very well with kids, and is loyal to and protective of them, so the "Staffy as Nanny Dog" reputation has stuck. Staffies (like other Bull Terrier breeds) have unbelievably high pain thresholds. Due to their years of bull- and bear-baiting (and dog-fighting), these animals instinctively tolerate even serious injuries without whining or showing pain--so much so that owners are often unaware that their dogs are injured at all. Owning a Staffy is illegal in some municipalities. Unfortunately, all Bull Terrier breeds have a bad reputation as fighting dogs, so owning any Bull Terrier breed--of which the Staffy is one--is against the law in some towns and cities in numerous countries. Staffies are incredible jumpers. Numerous Internet videos show these dogs easily clearing a six-foot fence--from a standstill. 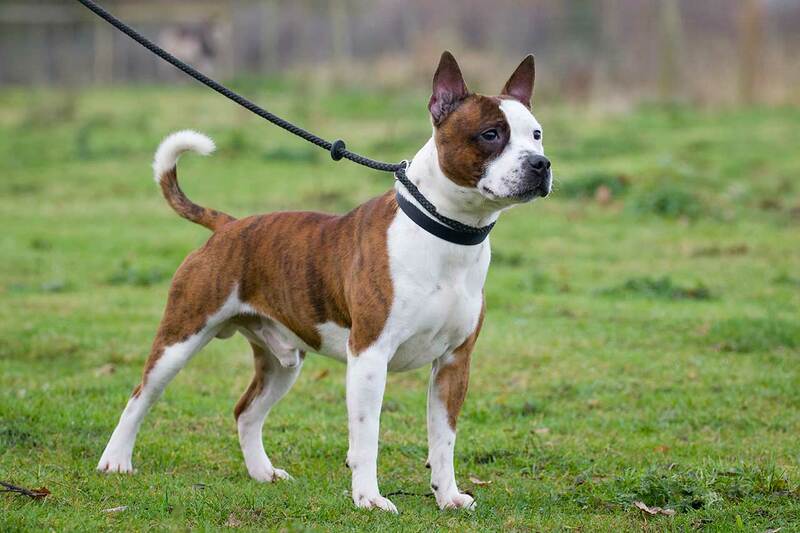 Owners are encouraged to erect fences meant to keep their Staffies in their yard as high as 8-10 feet. Easily the most important health concern about Staffordshire Bull Terriers is their very high threshold to pain: they may fail to exhibit signs of an injury, and as they are very curious and remarkably fearless, internal and external injuries are very possible. On the other hand, they are also susceptible to eye problems, joint ailments, tumors, flatulence, skin allergies, seizures and muscle tremors. Kept healthy and happy (and despite some of their health issues), Staffies tend to have a life expectancy of 12 to 14 years.